10Web is the only all-in-one platform offering premium solutions for creating and maintaining your WordPress website. With specific plans appealing to both large-scale businesses and personal use, 10Web’s innovative tools will help you host, build, launch and then optimize and maintain your WordPress websites with industry-leading standards that users have come to expect from 10Web. 10Web takes care of your website every step of the way, from state of the art Cloud Hosting. 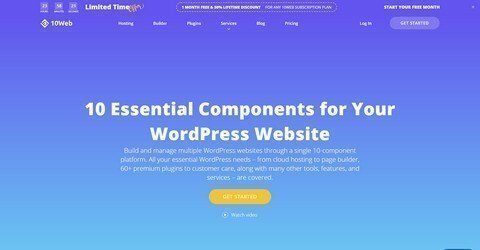 So you can provide your website with the reliable host it deserves, site builder powered by 10web’s own premium widgets and Elementor, lightweight and optimized themes, over 60 premium WordPress plugins, and the list goes on. 10Web is offering new users a lifetime 65% discount on any subscription plan. This coupon is a perfect way for both beginners and experienced users to start benefiting from the complete 10Web package. Coupon is applied automatically.